Synopsis: Raiders of the Lost Ark: Archaeologist and adventurer Indiana Jones is hired by the US government to find the Ark of the Covenant before the Nazis. The Temple of Doom: After arriving in India, Indiana Jones is asked by a desperate village to find a mystical stone. He agrees, and stumbles upon a secret cult plotting a terrible plan in the catacombs of an ancient palace. The Last Crusade: When Dr. Henry Jones Sr. suddenly goes missing while pursuing the Holy Grail, eminent archaeologist Indiana Jones must follow in his father’s footsteps and stop the Nazis. Raiders of the Lost Ark: The famous scene in which Indy shoots a marauding swordsman was not in the original script. Harrison Ford was supposed to use his whip to get the sword out of his attacker’s hands, but the food poisoning he and the rest of the crew had gotten made him too sick to perform the stunt. After several unsuccessful tries, Ford suggested “shooting the sucker.” Steven Spielberg immediately took up the idea and the scene was successfully filmed. The Temple of Doom: D.R. Nanayakkara, cast as the Indian village Shaman, did not speak a word of English. He delivered his lines phonetically by mimicking Steven Spielberg who was prompting him off camera. The pauses in his dialogue were therefore not for dramatic effect, but rather waiting for his next line. The Last Crusade: This was the first movie in the franchise to receive a PG-13 rating. 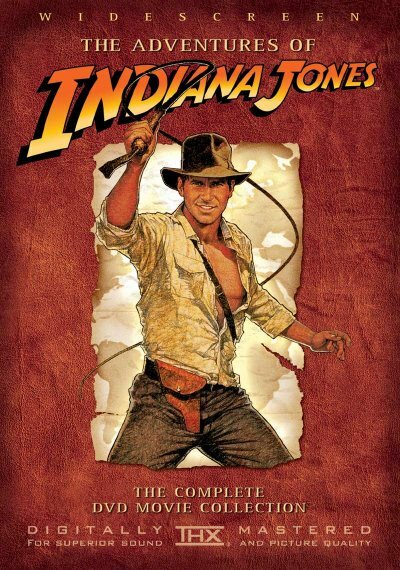 Its predecessor, Indiana Jones and the Temple of Doom, was instrumental in the creation of the PG-13 rating; however the MPAA only gave it a PG rating. Raiders of the Lost Ark: SALLAH: Asps… very dangerous… You go first. The Temple of Doom: WILLIE: I had bugs for lunch. The Last Crusade: MARCUS: Well don’t you see? The pen is mightier than the sword! These movies are so much fun. My favourite is easily The Last Crusade. Harrison Ford and Sean Connery have such great chemistry, and Denholm Elliott and John Rhys-Davies are hilarious together. Plus, I love the obstacle course of booby traps leading to the Holy Grail. And while I still love it, The Temple of Doom is my least favourite of the trilogy; it’s very xenophobic and sexist.